As the EJC launches work on a Criminal Justice Reform Initiative, we would like to invite Kehilla members to join us in understanding this highly pertinent and timely set of issues. Over the last decade, massive organizing efforts, led especially by black and brown activists and their allies, are shining a harsh light on America’s deeply unjust criminal justice system. 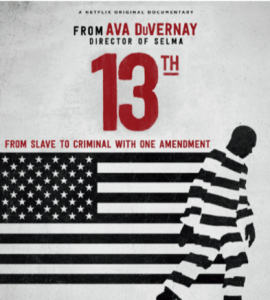 To better understand the scope and history of the problem, EJC members came together in December to watch and discuss Ava DuVernay’s award-winning 2016 documentary, 13th. The film interweaves historical footage and contemporary analysis to explore the nexus of racist and economic forces behind the mass incarceration of African Americans. We suggest anyone interested find a way to see this movie, currently available through Netflix. (It is possible the EJC will sponsor an event showing parts of this film.) Its content is powerful and upsetting, so perhaps is best viewed with others. Anyone wishing to organize a Kehilla event around 13th can contact EJC Chair Karen Rachels, karenrachels@gmail.com, for encouragement and assistance. 13th is titled after the Thirteenth Amendment to the Constitution (1865), which freed the slaves and prohibited slavery except as punishment for a crime. The film contends that slavery took different forms thereafter, through practices like enabling police to arrest poor freedmen and force them to work for the state under convict leasing; disenfranchisement, lynching, and Jim Crow; politicians declaring a war on drugs that weigh more heavily on minority communities; and, by the late 20th century, mass incarceration of people of color in the United States. 13th charts the explosive growth in America’s prison population. In 1970, there were about 200,000 prisoners; today, the prison and jail population totals more than 2 million. 25 percent of the people in the world who are incarcerated are incarcerated in the U.S., a country with just 5% of the world’s population. The film examines the prison-industrial complex and the emerging immigration-based or focused detention-industrial complex, demonstrating how much money is being made by corporations from such incarcerations. Despite modest recent reforms to some federal and state incarceration policies, urgent work remains to be done. Close to home, the drive for reform of state and county prison and jail policy and conditions is being led by groups like the Ella Baker Center, the Justice Reinvestment Coalition of Alameda County, and the Live Free Committee of OCO (Oakland Community Organizations). Last October, Live Free issued a report, entitled, “What’s Up with Our Jails? Holding Alameda County’s Sheriff Accountable,” that detailed shocking abuses in the Alameda county jails and Sheriff’s office. Readers can find the full report at: http://www.oaklandcommunity.org/ourjails/ and examples of the media coverage it generated at: [http://www.oaklandpost.org/2018/10/05/report-alameda-county-jails-reveals-dastardly-conditions/] and [https://www.mercurynews.com/2018/10/07/letter-alameda-county-jails-are-failing-inmates/]. EJC member Richard Speiglman was instrumental in researching and writing the report, and the full committee is now focused on organizing around the report’s insights and recommendations. (3) Encourage wider participation in our congregations’ social/economic justice committees and efforts to connect with one another. A task force has been formed to plan the workshops. For information, contact EJC task force members: Richard Speiglman, rspeiglman@sbcglobal.net; Laura Finkler larryandlaura@comcast.net; or Karen Pernet, kepernet@gmail.com.